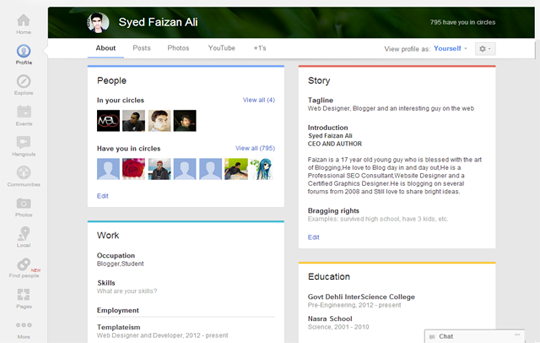 The buzz has just hit the internet that Google+ has just updated its interface for all of its users. 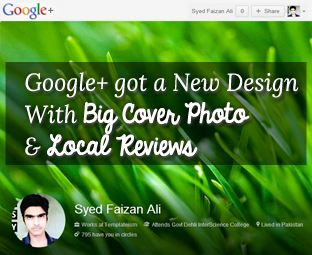 They have also rolled out some new features for its profile including “large cover photos and a local reviewer tab”. The company publicly annoyed on Wednesday that users will gradually but surely start to see the some new features and the redesigned profiles and pages. 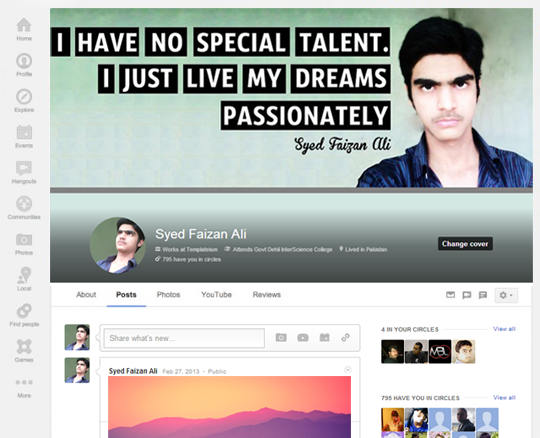 Rightly speaking the design is totally incredible the large cover photo has given a new life to the Google+ profiles and pages. Today, in this article, we will discuss about Google+’s new features and profile/page improvements. Members will start to see a larger cover photo. Now, cover photos display 2120 pixels by 1192 pixels at a 16:9 ratio fully stretched. According to Google, “This way more images can be joined in the cover photos, and there’s more room for your selection to sparkle”. The old cover photos would be still there until or unless you changed them yourself. In case your profile is not updated yet, then see the following snaps. The About page is also fully stretched and completely revamped. Now it looks more stable and elegant. The full-width about us page appears to be inspired from Facebook, but still it is better and much smarter than the previous one. Everything is now in a systematic order and people with small width monitors can read out your details without zooming in the text. Among the changes, we have a new tab labeled as “Local”. 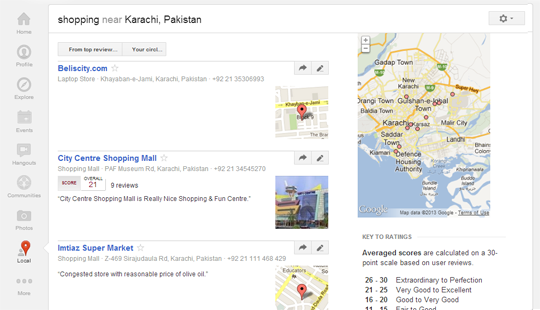 It is a smarter move by Google to expand their local searches through their platform. Users can now search or find restaurants near their neighborhood. Users can even +1 the local areas like restaurants, shopping malls and more, or they can even write a short review about their services to help others finding a better and smarter place. The profile looks neat and clean now. Though, the only change we noticed is of the way profile picture appears and, the cover photo but still its look tidy. 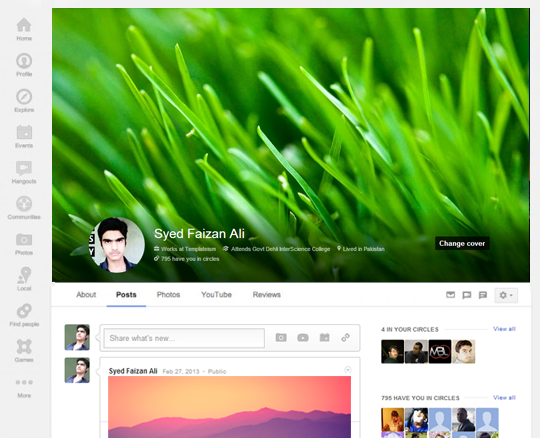 Personally, I loved the new look of Google+. Now, let’s wait till tomorrow because Facebook is also ready to launch its new look plus a new multiple feed feature. What are your thoughts? 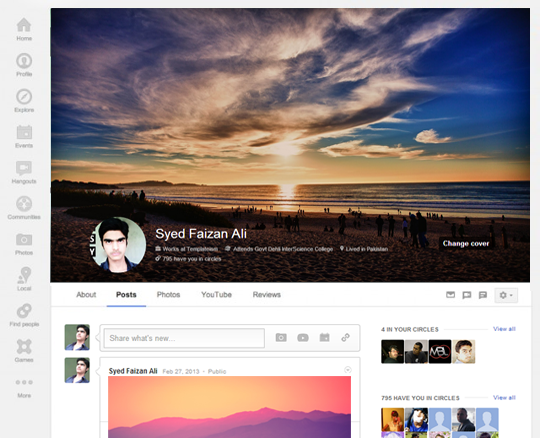 Does Facebook will recheck their plans and would beat the new look of Google plus? 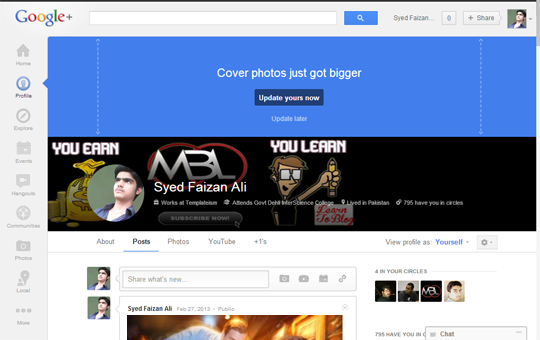 For the time being my vote goes to Google+ the new profiles of Facebook aren’t that excessive. Let’s wait what Facebook would present tomorrow. Trying it, thanks for information ! hey mate i need ur help.....i dont know what's wrong with my posts Show Option. thats was my 1 blog prob....but i made a new one for iphone games.....its also shows the same problem.....what i do..?? these three things we put in blogger seo section but now days many bloggers use dynamic meta description and some others uses static meta description. I have changed my keywords and description style in different ways but not working very well..are u using dynamic meta description or statics..
please syed tell me the right way how to put these three things in well format like yours.